Imagine a day filled with one amazing adventure after another. Come let Disney take you on an all-day journey that immerses you in exhilarating Disney stories with fantastic attractions and breathtaking shows and spectaculars. Disney California Adventure® Park, where you’ll step into the adventures that inspired everything Disney! Disney California Adventure® Park has been expanded and re-imagined in exciting new ways. Your whole family will be fully immersed in your favorite Disney and Pixar stories like never before. 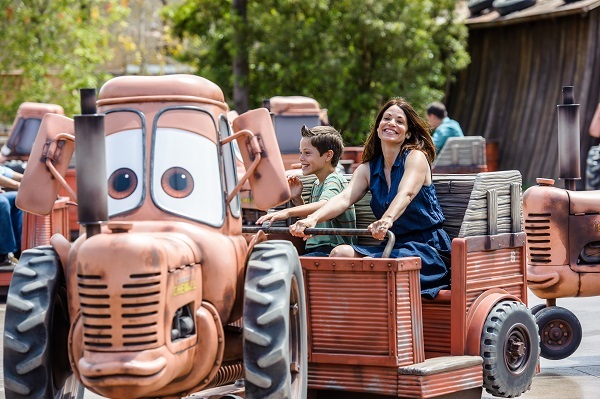 Get your dancing tires on as Mater sings and you hitch a ride on your own twisting, twirling little tractor. Sit back and enjoy the ride as the tractors dance and their trailers swing along on Mater’s Junkyard Jamboree. Of course, all of your favorite attractions are still here. Feel the rush on California Screamin’ and fly high on Soarin’ Over California. 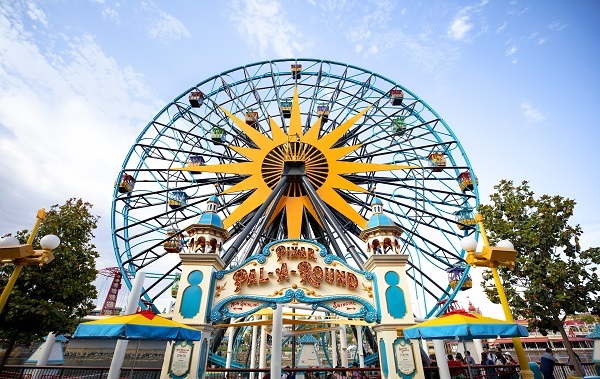 So join us, because it’s going to be a big year at Disney California Adventure® Park. It’s immersive Disney and Pixar storytelling the whole family can enjoy day and night! Learn the secrets of how to draw a classic Disney Character with a hands-on lesson from a real Disney artist! These stainless steel silver bullet rockets glisten in the California sun as they take you for a spin at the water’s edge. Orbit suspended from a 90-foot tower in “galactic gondolas”. These sleek orbiting rockets were inspired by the beach community cinema matinees starring Buck Rogers and Flash Gordon. The wild blue yonder just got wilder, thanks to Goofy’s Sky School! Climb aboard your crazy training vehicle and hang on as you take to the sky for a zany roller coaster ride up, down, around, over and through the clouds. The “Wetter the Better” is the motto of this thrilling raft adventure that sends you roaring down an abandoned mine and rushing on a river through the scenic foothills of the Sierra Nevada. It’s one of our tallest, longest, fastest rapids ride yet! Introducing Guardians of the Galaxy—Mission: BREAKOUT! in Disney California Adventure® Park, your chance to be a hero and save the Guardians! This daring attraction features some of your favorite Characters from the films and includes a breathtaking free-fall sensation with incredible visual and audio effects. A variety of ride experiences means you’ll want to come back again and again to experience them all. And it’s all brought to life with the unforgettable music inspired by the film soundtrack. Your mission: Hero Up and help Rocket and his friends break out! Buckle up for an exhilarating ride into the world of The Incredibles on this newly re-imagined attraction! By the time you arrive back at the pier, you will know why this is the adrenaline rush of the century! This state-of-the-art steel roller coaster evokes the great thrills of wooden coasters from days-gone-by yet it catapults riders from 0 to 55 in less than five seconds and surfs over a mile of track with a 108-foot drop. There is also state-of-the-art onboard music to match the series of banking turns, speedy twists and the climactic loop. Height Requirement: 40″ (102 cm) or taller. There is a 350-pound maximum combined passenger weight (per vehicle). Sail straight up 40 feet into the air and drift like a jellyfish back down in this kid-friendly experience that’s enough to make you jump for joy. Billowing parachutes enhance the sensation that you are riding in a giant jellyfish and a towering kelp garden maintains the feeling that you are underwater. There’s nothing fishy about why this will make a splash with kids of all ages. Buckle up—you’re in for a lively ride when these Italian imports roll, reel an’ kick up their wheels in Cars Land! Climb aboard Mater’s Junkyard Jamboree and enjoy a “tow”-rific ride. Baby tractors pull a Junkyard cart – with you in it – that gets twirled in time to the tunes broadcast through the magnificent Mater’s Junkyard Jukebox. The Pixar Pal-A-Round gondolas offer a classic Ferris wheel experience. Enjoy swinging and non-swinging gondolas, each decorated with the image of a different Disney•Pixar movie character. 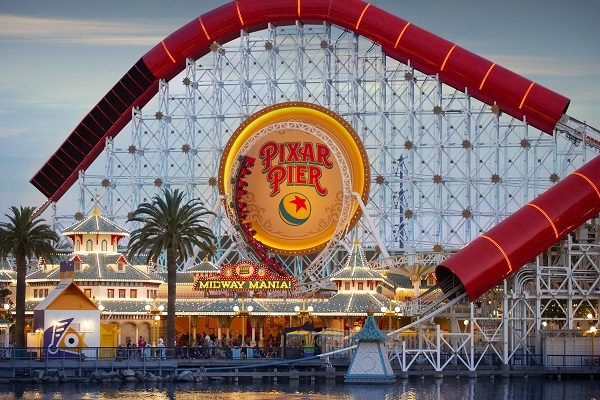 Settle in to your seat as you’re lifted off the ground, gliding round and round—to heights of 150 feet for panoramic vistas of Pixar Pier and beyond. 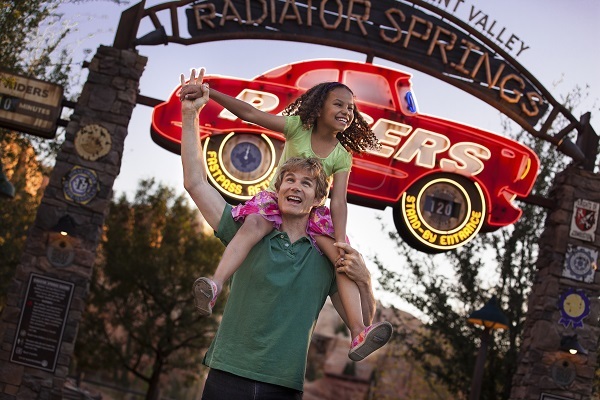 Buckle up at Radiator Springs Racers and compete with other speed seekers! Zip over hills, zoom around banked turns and cruise down straight-aways past the spectacular red-rock formations of Ornament Valley. Some of your favorite friends, like Sally, Luigi, Guido, Mack and Ramone, can be seen at the track. Ding! Ding! Hop aboard for a ride on Buena Vista Street and throughout Hollywood Land. Come to Wilderness Explorer Camp to meet Russell and Dug, from Disney·Pixar’s Up. Search forested paths, try your hand at rock climbing and swing on rope bridges along the Redwood Creek Challenge Trail — an outdoor recreational area for Guests of all ages. Earn Wilderness Explorer badges along the way! Some challenges have age and height requirements. Height Requirement: Guests between 40″ and 48″ must ride in a tandem swing with a responsible person. Mickey’s conducting and Donald’s disrupting – until a tornado hits the orchestra! Swing through the air in your musical chair as Mickey’s barnyard orchestra plays William Tell’s “The Storm”! Get ready to soar over the Great Wall of China, Switzerland’s Matterhorn mountain, and spectacular scenic wonders on every continent in this brand new adventure. At Disney California Adventure® Park, your imagination can take flight in this epic re-imagining of a classic attraction. Come join us for Soarin’ Around the World! At this destination in the Disney Animation Building, learn how the animated characters spring to life through 2 hands-on exhibits. 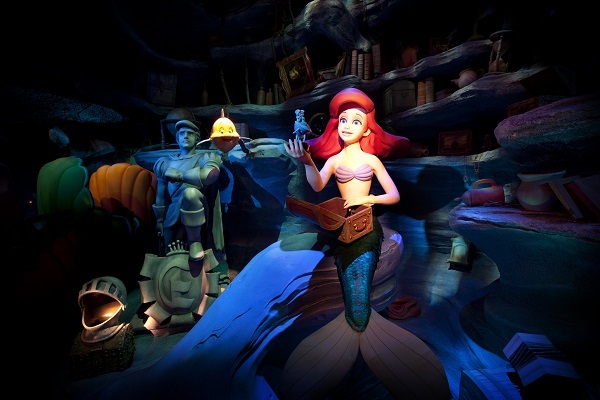 “This is the first time you’re going to be able to ride through the experience of The Little Mermaid. We want to make this a very immersive attraction to where we’re actually to take people under the sea. It’s mostly just good old fashion theatrical story telling that we’re using. We also have some new special effect technologies that we want to utilize here…The Little Mermaid is going to be an incredible experience.” – Interviews with Walt Disney Imagineering. Step right up and compete in an interactive “Toy Story” adventure like no other. It’s Toy Story Mania!— an attraction inspired by Disney·Pixar’s “Toy Story” films. So come grab some 3-D glasses before boarding your ride vehicle and zipping off into a world of immersive, midway-style games hosted by favorite Characters like Woody, Buzz, Rex and Hamm! Use your spring-action shooter to launch darts at balloons, rings at aliens, eggs at barnyard targets and beyond. See who can rack up the most points. (Psssst. Certain targets trigger surprise reactions and special effects!) On your final stop, the scores are tallied and the highest are displayed. Will yours make the cut? There’s only one way to find out. And it’s never the same experience twice. If you’re, like, looking to chat it up with a totally cool sea creature, cruise into Turtle Talk with Crush, in Disney California Adventure Park. Inspired by Disney·Pixar’s, “Finding Nemo,” this righteous attraction is, like, totally interactive. Crush can see and talk to you, and you can see and talk to him – it’s awesome! And this old school surfer (he’s, like, 150 you know) is ready for some serious Q&A! Squirt, his cute little offspring dude, wants to know more about the human world. Crush, being the cool dad that he is, is coming straight to the source – that’s you, dude – to get the 411. Make a stop at this frosty spot where you can receive a royal greeting, right out of Arendelle! It’s Anna & Elsa’s Royal Welcome, where the fabled sisters are eager to meet you and share stories of their icy adventures. And in return, they’ll want to learn all about your kingdom! Anna and Elsa make their appearances at Character Close-Up inside the Disney Animation building on Hollywood Boulevard in Disney California Adventure Park. Plus, do you want to draw a snowman? Well, now you can! Just drop by Animation Academy—where a real-life artist is on hand to teach you how to sketch characters like Olaf and Marshmallow. Kids, come shake it at the newest high-energy dance party show, filled with favorite Disney Junior Characters and music!! Shimmer along with the show and Glow at Home with these illuminating interactive accessories! Hit your mark in the heart of Hollywood to discover some of your favorite friends from the silver screen. Have some fun with a Frozen friend as you come nose-to-nose with Arendelle’s summer-loving snowman, Olaf. Hop on over toward Hyperion Bridge to meet a star of the silver screen—Oswald the Lucky Rabbit! Make a pit stop at this popular Cars Land hotspot and get revved with Piston Cup stars. Sit back and groove to live beats while you eat. View the Entertainment Schedule at Disney California Adventure® Park to explore upcoming performances. Watch in awe as water, light and fire immerse you in a stunning extravaganza of fantasy and imagination! As unforgettable Disney music surrounds you, enormous walls of water come alive with scenes from your favorite Disney stories. Be among the first to experience this spectacular new show at Disney California Adventure® Park. Guests can now be a part of the show at “World of Color” with the new “Glow with the Show” Ear Hats. Using the latest interactive technology, our newest ear hats will quite literally let Guests “Glow with the Show.” The iridescent ears change to complement and harmonize with what’s happening around Guests, allowing them to become a part of the magic of our nighttime spectaculars, such as “World of Color” and Mad T Party. Guests can grab their own “Glow With the Show” Ears on their next visit to Disney California Adventure Park – they are available for purchase at locations throughout the Park and many merchandise carts.